I'll always remember the day my then four-year-old daughter's class were sent home with a diet sheet from the local authority. It advised that if your child became hungry between meals, you could try giving them a sugar-free jelly. Sure! That'll fill them up – a mix of gelatin, sweeteners, colouring and water. 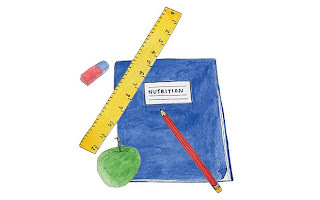 For a long time official nutritional theory was largely negative. A food was 'good' if it had zero fat, zero sugar or zero cholesterol. This was a joyless way of looking at the process of eating. And it didn't work. While governments and doctors exhorted us to cut our pleasures out, obesity levels soared. We are now in the midst of a nutritional sea change. The old enemies of fat and protein are being welcomed back, while refined carbohydrates are the new devil. But the change is far bigger than this. There's a new sense that food is not just about calories in, calories out. We are starting to realise that 400 calories of salmon and lentils might keep us going for longer than 400 calories of low-fat white sliced bread. What we are seeing – and about time, too – is a return to the old concept of nourishment. The wartime generation, living with scarcity, judged foods largely in terms of how they nourished you. Fish was brain food. Meat and milk would build you up. Butter and eggs were husbanded, as golden treasure. Blackcurrant and oranges were valuable vitamin C. Children needed to be fed, not fobbed off with sugar-free jellies. We came to reject the idea of nourishment as old-fashioned. Looking at our increasingly chubby youth, we felt that 'nourishing' was the last thing they needed. We were wrong. A gathering body of scientific evidence suggests that the obesity of the West and the malnutrition of the developing world are not as far apart as they seem. 'Eat less and exercise more – it's not rocket science, is it?' is a view often expressed when the subject of obesity comes up. But this takes no account of the complexity of the problem – nor the fact that it has never been seen on this scale before. A 2009 paper in Nutrition Reviews by Garcia, Long and Rosado found that obesity worldwide was linked with a lack of vitamins and minerals. Obese children are far more likely to be deficient in vitamin D. Deficiency in vitamins C, E, A and zinc has also been associated with higher body fat. You can be overstuffed and undernourished at the same time. Meanwhile, Robert Lustig, a children's doctor, has electrified public opinion in America by suggesting that one of the root causes of obesity is, bizarrely, hunger. His argument (watch his YouTube video, 'Sugar: the Bitter Truth') is that the excess sugar in our diets – much of it in 'low-fat' processed foods – messes with leptin, a hormone that tells us when we are full. If Lustig is right (some scientists dispute him), children who gorge on sugary foods are not just being greedy; they are often genuinely hungry, because their diet fails to satisfy. The answer is not sugar-free jelly but a completely different approach to healthy eating, one that recognises the complex needs of the human body. The real mystery is how we ever forgot that the point of food is to feed.